I usually can’t resist a good deal on an ingredient when I see it. Then I try to find a recipe based on that ingredient and in combination with what else I already have at home. 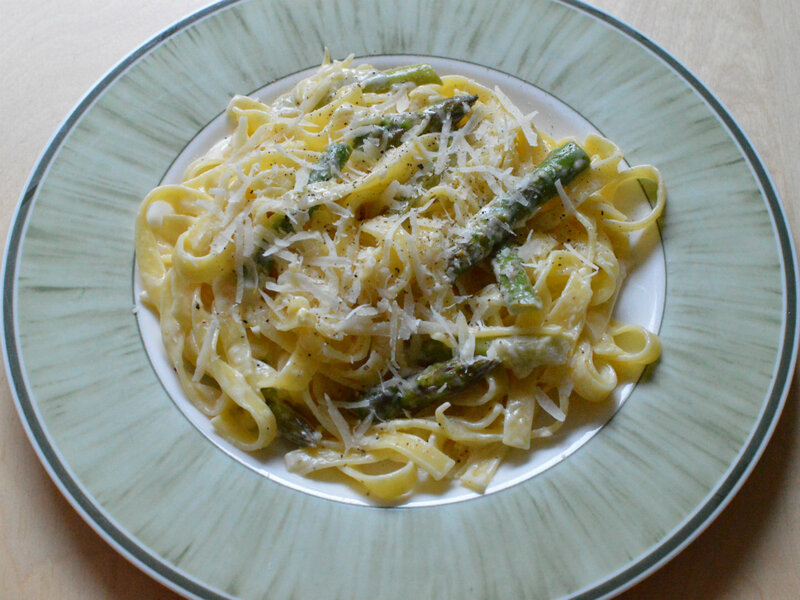 This time it was asparagus and the recipe also included lemon, cream, tagliatelle and parmesan. Just reading the ingredients makes me hungry and the final outcome of this asparagus lemon pasta was so good it will definitely be a go to recipe for when I have asparagus at hand. The original recipe is from a Swedish online magazine and also included parsley and shrimps. Cut away the hard root end of the asparagus and throw it away. Divide the remaining part in 3. Put the buds aside and divide the remaining pieces lengthwise. Take another pot for the pasta and heat up water with some salt. Dry the pot and add butter and cream. Heat up while stirring and let it simmer for 5 min. Start cooking the pasta so it gets ready at the same time. Wash the lemon and then zest it, add it and the juice of half the lemon to the sauce. Stir it together with the pasta then carefully add the asparagus.